Cooler temperatures bring heavier sauces and warmer dishes to my table. In the same way that I cannot get enough salad in the summertime, I am ravenous for platefuls of pasta with rich sauces in the winter. 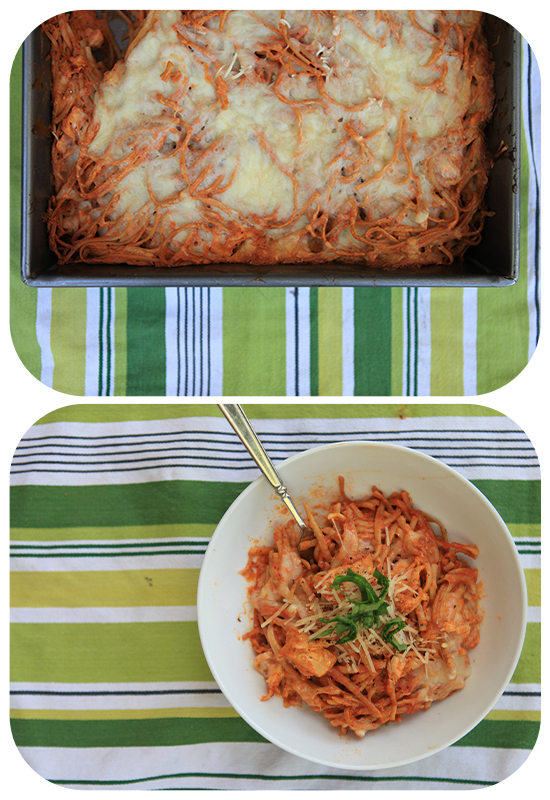 This recipe for a baked pasta with chicken and creamy red sauce fits the bill perfectly for a cold day. A rustic baguette and a little Caesar salad make it a meal fit for company. I put this recipe together years ago after a trip to one of my favorite local Little Rock restaurants, Cafe Prego, but I have updated it a little and added Whitney’s photos. It is most delectable if you marinate and grill the chicken according to the instructions, but it can also be made a little quicker with baked or boiled chicken, or even a cut up Rotisserie. Whenever I make a baked pasta dish, I line the counters with 9 X 13 pans and make extras to freeze or give away. Keeping meals in the freezer makes me feel less guilty should the opportunity arise to go on a last minute girl trip. Anybody? Cook pasta a little less (9 minutes) than the package instructions, and divided into 3 9×13 pans, drizzled with olive oil. Divide chicken among dishes. Mix about 1 cup Parmesan into each dish. Melt butter in large cast iron skillet or enamel Dutch oven. Add garlic and herbes of provence and cook for about 4 minutes. Turn heat to medium low and add 1/2 cup flour gradually. Stir in marinara sauce. Slowly add remaining flour. Let sauce thicken, stirring constantly. When all the flour is disolved, gradually add cream until sauce and continue to stir over medium heat until sauce is heated through. Salt and pepper to taste. Divide sauce over the three dishes of pasta. Mix in a little with two forks. Cover with foil and bake at 400 degrees for around 30 minutes. Remove foil and bake 5 more minutes. I just got a jar of Herbs de Provence in the mail (yay, Penzey’s!) and as soon as I opened it, it took me back to my year in France when it was the only spice I had, I’m so glad you used it in this recipe! I’ll be making this one soon, for sure. It is the most favored jar in my herbs and spices shelf for sures!! LOVE!